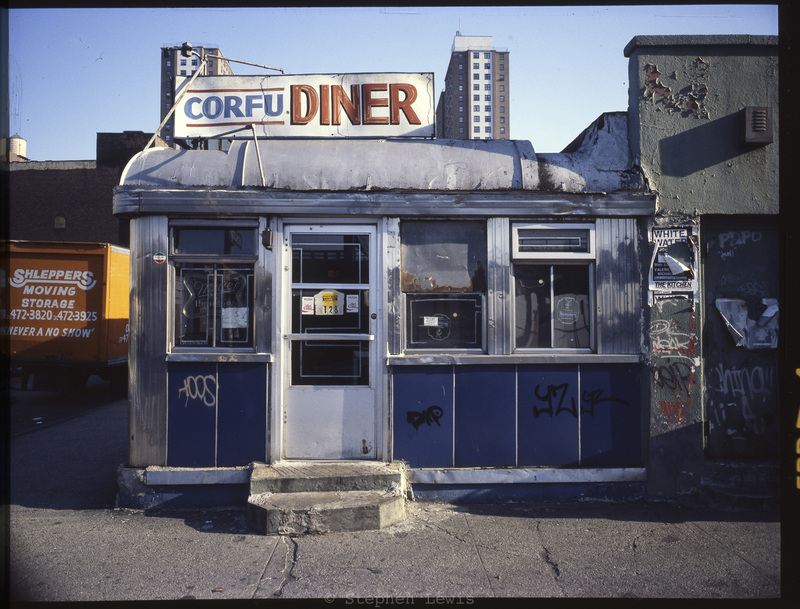 Both photos were taken in the late-1980s on 6×4.5cm transparency film using a light-weight, fixed-lens, wide-angle (28mm-equivalent) Fuji roll-film camera which featured manual focusing by estimation of distance and depth-of-field and a very accurate built-in manual light meter, so accurate, that when using it, I almost never bracketed exposures, not even when the camera was loaded with low-dynamic-range, transparency film. I miss the camera and I miss the 3:4 format ratio of its output. 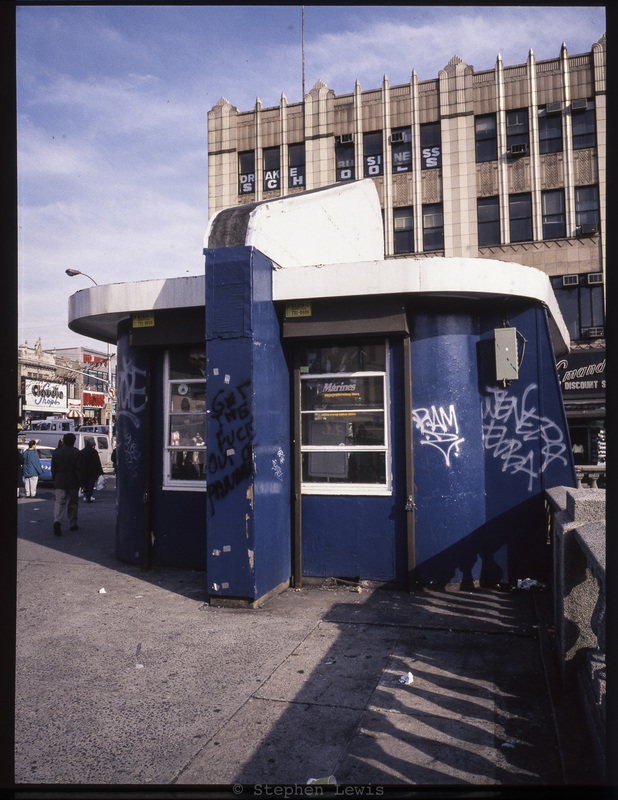 Below: The last of several World-War-II-era US military recruiting booths (this one, if I am correct, originally built for the Navy, per its streamlined art deco take on the bridge and stack of a ship, and later transferred to the Marines) that stood on the Fordham Road overpass spanning the Grand Concourse in the Bronx. (In the background, the Wagner Building, a 1930s office block, one of a piece with the many great art deco apartment and commercial buildings that line the Concourse from 161st St. northward). From the early-1940s on, generations of neighborhood young people — Jews, Germans, Italians, Poles, and Irish, followed by Puerto Ricans, Dominicans, and African-Americans — volunteered at this and the other booths to fight America’s wars, just and cynical, against enemies real and invented. Some volunteered out of idealism and others for adventure, to avoid prison, or to escape into the larger world and begin life anew. Many returned alive, be it unscathed or maimed; many others, however, had their lives cut short.